If you are a business owner with employees, you are required to file and pay payroll taxes. Failure to properly file your payroll tax returns and deposit your payroll taxes on a timely basis will not go unnoticed by the IRS or the State. The IRS assigns a higher priority to collecting unpaid payroll taxes than they do even to collecting back income tax debt. The penalties assessed on delinquent payroll tax deposits or filings can be stiff, and can dramatically increase the total amount owed in a very short period of time. And, if payroll taxes go unpaid, the IRS can and will go after a company’s assets, put the company in financial jeopardy, and, in some cases, hold the business owner personally liable for the debt. The IRS requires businesses to withhold Federal Income Tax, Social Security and Medicare taxes from their employees’ wages, the amount of which depends on the employees’ Form W-4’s. 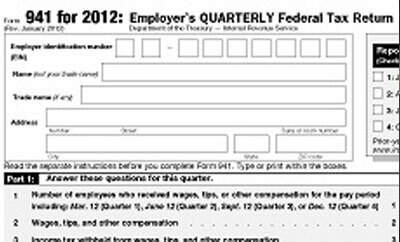 These IRS payroll taxes are to be paid on a quarterly basis: March, June, September, and December (Form 941). Under certain circumstances, however, some small business owners may be eligible to file these taxes on an annual basis. The deposits of payroll taxes can be made to the IRS electronically or by taking the deposit to an authorized financial institution. The IRS determines how often deposits are to be made, and they update these requirements each year, based on the annual payroll. Sometimes, a small business owner is simply unaware of the filing requirements and may become delinquent in their quarterly filings and/or deposit of their payroll taxes. For many businesses, financial problems can cause payroll taxes to not be paid on time and the payroll returns not filed on time. Both of these are among the worst things to do when business has fallen upon hard times. Though most business owners never intend to use the funds they have collected for payroll tax withholding (that they are holding “in trust” for the IRS), sometimes, when faced with the difficult choice of not making payroll or some other pressing business obligation, some business owners feel they have no choice but to use these funds to cover their operating expenses. When a business owes back payroll taxes, the IRS can and will be very aggressive in its collection efforts. If a business fails to pay the payroll taxes on time, penalties and interest start to accrue. If the payroll returns are not filed on time the penalties are substantially increased. Failure to file a return on time can incur penalties of 5% per month to a maximum of 25%. Add in other penalties and compounding interest and you have a tax problem that will quickly go from bad to worse. Should the unpaid payroll tax problem not be resolved quickly, additional IRS Enforced Collection tactics can include wage garnishment, bank levies and seizure of business assets, including accounts receivable, equipment, and automobiles. The IRS can also close a business for non-payment of payroll taxes. And, even if the business is closed or files for bankruptcy protection, the IRS will look to the owner of the business for collection of the penalties, interest, taxes and trust funds. In the case of a corporation or partnership, the IRS will look to the person responsible for paying the payroll taxes to collect the trust funds. This is known as the Trust Fund Recovery Penalty. If your business owes back IRS payroll taxes, it is very important to take immediate steps to deal with the payroll tax problems or you may quickly find yourself out of business. The best advice is to seek out professional tax representation to represent you with the IRS. You may want to avoid meeting with any IRS/State agents until you have met with a professional to discuss your options. The tax professionals at the Tax Group Center are ready to work with you to design a plan for paying those taxes and negotiating with the IRS so you don’t get hit with a bank levy or tax lien.